Home / News / EHF / Kiril Lazarov scores 1000 goals in EHF Champions League! Kiril Lazarov scores 1000 goals in EHF Champions League! 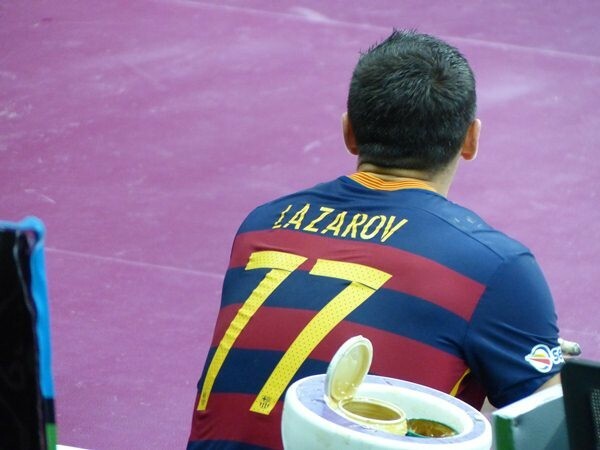 Macedonian handbal icon Kiril Lazarov scored 1000th goal at the VELUX EHF Champions League in win of his FC Barcelona Lassa against PICK Szeged – 30:28. His fifth was decisive, but the ball in the net of Szeged’s goalkeeper didn’t mean only two points for the reigning EHF CL champions, but also a new chapter in career of one of the best lefthanders of XXI Century. The 35-years old right back netted 1000 goals as the first ever player in the history of the European elite competition. He was preparing his record in T-shirt of four teams, PPD Zagreb, MVM Veszprem, BM Ciudad Real (BM Atletico Madrid) and FC Barcelona. Lazarov to stay until 2021 in Nantes! Kiril Lazarov is the new best EHF CL Final4 scorer in the history!